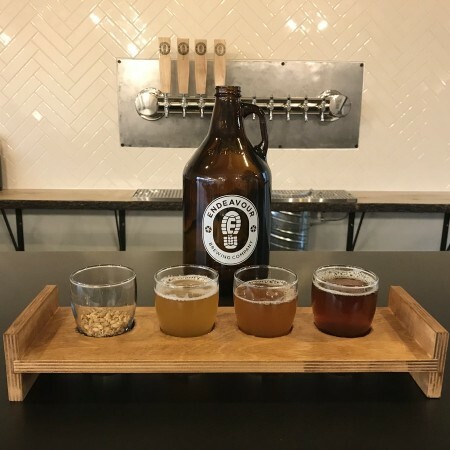 ST. ALBERT, AB – Alberta’s newest small brewery has announced that it is now open for business in St. Albert. Featuring a 15-hectolitre brewhouse, three fermenters, canning line, and a 40-seat tasting room, Endeavour opened earlier this week as has three beers available – Sudden Draft IPA (6.7% abv), Lost Flip Flop Saison (5.7% abv), and Adventure Brew Pale Ale (4.6% abv). Endeavour Brewing is located at 4A-215 Carnegie Drive in St. Albert, and is open 12:00 noon to 7:00 PM Tuesday to Thursday, 12:00 noon to 9:00 PM Friday and Saturday, and 12:00 noon to 4:00 PM Sunday. For more details, see the Endeavour Brewing website and Facebook page.